Born in Bath, David Bethell (originally Bethel) was educated at the King Edward VI School, Bath, and the Crypt Grammar School, Gloucestershire, followed by war service in the Royal Navy. From 1946 to 1951 he completed his education at the West of England College of Art (NDD) followed by Bristol University (ATD). After a lectureship at Stafford College of Art from 1951-56, he was Deputy Principal (1956-65) and Principal (1965-69) of the Coventry College of Art. 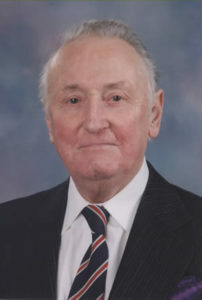 In 1969 he moved to the Leicester Polytechnic as Deputy Director, and succeeded as Director from 1973 to 1987 – the only Polytechnic Director in the country from a fine art background. He held many important national and international positions, including the presidency of the National Society for Art Education, membership of the Summerson-Coldstream Committee on art qualifications, the Council for National Academic Awards, British Council Adviser to the Hong Kong Government, and the Royal West of England Academy, of which he was an Artist Member, Senior Vice-President and Honorary Vice-President. Honours included CBE 1983, and degrees of Hon. LlD, Leicester (1982), Hon. DLitt., Loughborough (1987), Hon. DEd., University of West of England (1998), and Hon. DDes., Bournemouth (2001). David Bethell was also active in many locally orientated organisations and activities, including the Worshipful Company of Framework Knitters (Liveryman from 1976, Steward 1994-97, and Member of the Court of Assistants from 1997 to his death). He was also a member of the Board of the Leicester Theatre Trust (Haymarket Theatre) from 1979 to 1985. Presidential Address: An Approach to Vocational Education. Trans. LLPS vol. 97, 2003, pp. 2 – 9.